China: Chongqing, S Anhui, W Hubei, NW Hunan, Jiangxi, S Shaanxi, Sichuan (Emei Shan [Mt. Omei]), NW Yunnan.The variety yunnanensis is restricted to Yunnan. The population has undergone a recent decline due to deforestation. The decline may be ongoing. This species occurs in coniferous, mixed and broad-leaved forests as an understorey shrub or a small to medium sized tree, in mountains from 700 to 3400 metres above sea-level. This species yields high quality wood used in building houses, bridges (durability of the wood) and furniture; some of it is also used to make utensils and for wood turning. The seeds are edible and produce oil that is extracted; the essential 'torreya oil' is extracted from the aril. It is in cultivation in China, but not as widely as T. grandis; outside its native country it is only planted in a few botanic gardens and arboreta. The species as a whole is assessed as Vulnerable under criterion A2cd although both varieties (var. fargesii and var. 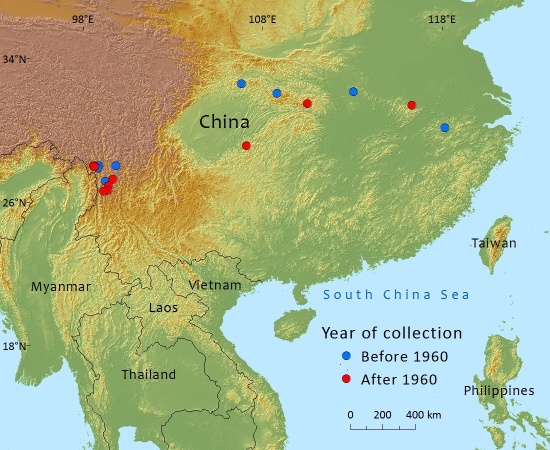 yunnanensis) have been individually assessed as Endangered under the A and B criteria respectively. This taxon is considered vulnerable on account of deforestation in many areas where it occurs or has occurred in the recent past according to herbarium collections made since the beginning of the twentieth century. Y.Yang,and D.Luscombe, 2015. Torreya fargesii, from the website, Threatened Conifers of The World (http://threatenedconifers.rbge.org.uk/taxa/details/994).